Researchers from Cleveland Clinic and the National Cancer Center of Singapore have identified a genetic alteration that plays a central role in the development of hepatocellular carcinoma, a type of liver cancer, and may lead to effective new treatments. Recent genomic research showed that one of the chromosomes (8p) in hepatocellular carcinoma cells (HCC) consistently loses about 500 of its genes. This deletion occurs in about 60 percent of all cases of hepatocellular carcinoma. 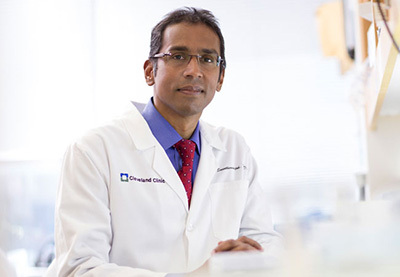 The discovery of some liver cancer patients with only small deletions of chromosome 8p allowed Cleveland Clinic researchers—led by Yogen Saunthararajah, MD—to target tens instead of hundreds of genes. Careful analysis of this shorter list helped them to identify GATA4 as a key gene. GATA4 plays a major role in gene expression in cells that line the surface of the liver, called hepatocyte epithelial cells. When a hepatocyte is missing one copy of GATA4, it fails to differentiate. In a vain attempt to produce fully formed hepatocytes, the precursor cells continue to replicate, resulting in tumorigenesis. This new discovery suggests that restoring GATA4 activity may help treat hepatocellular carcinoma by allowing hepatocytes to develop completely and focus on specialized functions, rather than replication. The researchers are testing this hypothesis in existing drugs and hope to move to clinical trials in about a year. The study was published in the Journal of Clinical Investigation. Dr. Saunthararajah is a staff member in the Taussig Cancer Institute and Lerner Research Institute and co-leads the Developmental Therapeutics Program of the Case Comprehensive Cancer Center.